The English name Deodara comes from the Sanskrit Devadaaru. "Deva" means Gods and "Daaru" means wood. The meaning of Devadaru is therefor; "the Wood of the Gods." The Devadaru tree is considered sacred. Forests of Devadaru trees were said to be a favorite place of the Sages worshiping Lord Shiva. There is a spiritual energy which extends from the place where a Devadaru tree is growing. The energy of the tree creates a mystical window for the Devas to see into the physical realm. Its wood is a fitting substitute for sandalwood for pujas and tilakams (forehead markings) although it is somewhat heating. The wood is bitter, pungent and heating. The bark is somewhat more astringent. It reduces Vaata and Kapha, but increases pitta. It is useful to increase digestion and appetite. It is grounding and helps reduce indigestion caused by anxiety. It help to increase apaana vaayu, and can help to cure constipation. Devadaru removes accumulated toxins (ama) from the body and clears the blood. It can help reduce inflammation and itching. Devadaru is one of the best expectorants for kapha because it removes excess mucus and dries the lungs. It is useful in the treatment of pain because it relieves spasms and relaxes the muscles. It nourishes the heart, and helps to cultivate devotion and spiritual dispassion. The outer bark is more astringent and is used externally externally to reduce bleeding and treat wounds. 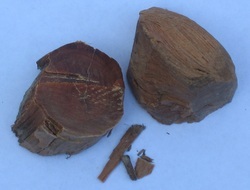 The outer bark is taken internally as an astringent to relieve diarrhea and nerve pain. Devadaru helps to promote meditative consciousness and helps to open a channel into the inner plains. It can be used as a tilakam (anointing the forehead) taken internally or offered in puja or Yajnam. It is a suitable substitute for the endangered Sandalwood often used in poojas. It is not cooling as is Sandalwood, but it does possess many of the calming, grounding, and perception increasing properties. An aromatic oil is distilled from the fragrant heartwood which is warming, calming, and grounding.. The wood and inner bark are used medicinally. As a Vata-Kapha heart tonic Devadaru may be combined with Ashwagandha, Arjuna, Cardamom, Guggulu, and Tulsi. As an expectorant it combines well with pippali, pushkarmul, and yashti madhu. For spiritual awareness it combines well with brahmi, tulsi, and rose petals. For constipation it may be taken with sat isobgol, triphala, and ginger. For pain it combines well with shankha pushpi, jatamamsi, myrrh, and turmeric. For anxious indigestion it can be combined with black salt, ajawan, celery seed, nutmeg, and cumin.